The Seattle Seahawks are a team of unique players, loud fans, and an insanely strong brand. Everything from their fans (The 12th Man), to their defensive secondary (Legion of Boom), to their players (Beastmode), there’s a lot that marketers can learn from the team. Pete Carroll has a really new-age way of coaching as far as football goes. He believes in the potential of each of his players - most notably embracing and supporting once-troubled Marshawn Lynch, who was first drafted by the Buffalo Bills in 2007 but had a difficult time there; and elevating third-round draft pick, Russell Wilson, to be their starting quarterback. Many critics graded the Seahawks’ 2012 draft class as one of the worst of the year, when in retrospect it yielded several productive players - namely Bruce Irvin, Bobby Wagner, Russell Wilson, Jeremy Lane, and JR Sweezy. Allowing these players and their personal brands to shine has brought the Seahawks brand into the limelight as a unique, bold, relatable team that Seattle sports fans want to stand beside - something advertising dollars could never buy. Allow your employees to develop personal brands and support their online uniqueness. Believe in them, and they can be your biggest brand advocates. Build a team of influencers, but know that not everyone is meant to be an influencer. Start by supporting and amplifying your employees/executives who are active and maybe influential already. The Seahawks are a marketing machine. Some of their marketing is deliberate (an agreeable color scheme and cool uniforms), some is thanks to their players (corporate sponsorships), and some of their marketing is completely organic (the toughness of their Legion of Boom, characterized by Richard Sherman’s interview personality). It’s interesting to point out that Seahawk fans are so supportive, they consider themselves a part of the team, hence The 12th Man. 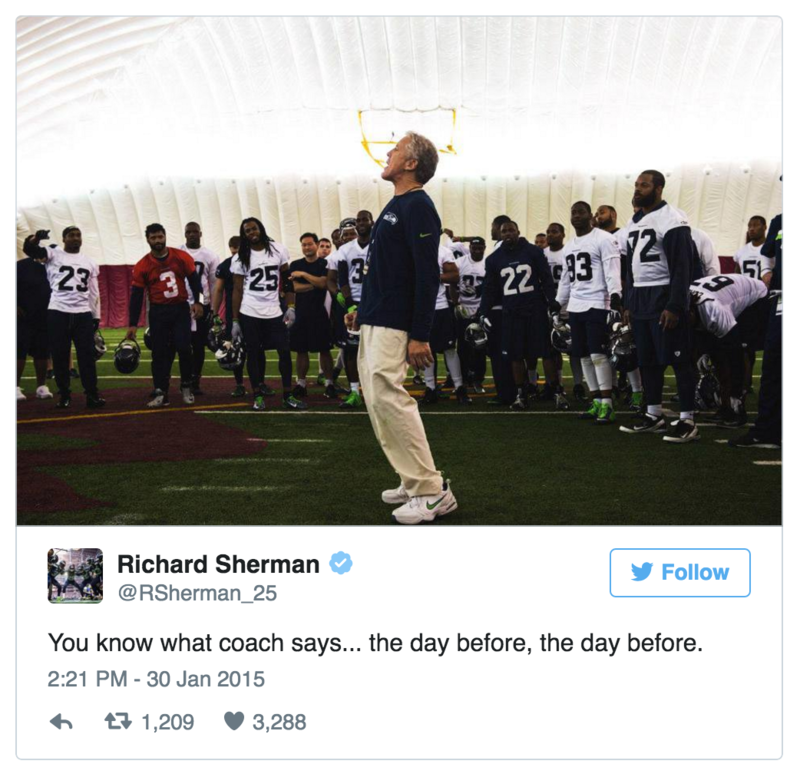 How did the Seahawks achieve this level of brand advocacy? They gave their fans huge value by assigning them a “position” on the team - customer relationship management. Their fans identify so much with the brand, they are proud to endorse them. Identify with your customers. Know who they are and who they portray themselves as, then fit in that. For more viral content, increase the odds for sharing by ensuring that content you release will help build your audience’s personal brands. Value your audience. Ask for product feedback or tips from your customers and online audience. Let them know that they play an instrumental role in your success. Identify your influencers and support them. Establish a two-way relationship with your influencers: promote and support them as if they were a part of your own business - because as advocates, they are in a way an extension of your business. Richard Sherman has meticulously branded himself as a passionate, tough and villainous defender. He’s well known for taunting Tom Brady off the field after a win over the Patriots in 2012, and being labeled as a villain from his legendary 2013 interview with Erin Andrews. But despite his hyper-competitive, some say “thug” persona, Sherman also frequently shows his intelligent, well-educated side (a communication major from Stanford), and insists that what you’ve seen on the media is only a small glimpse of who he is. After his infamous Erin Andrews interview, he wrote this article in Sports Illustrated to prove it. He recently wrote another Sports Illustrated article; this time a baby announcement, full of inspirational parenting beliefs. DON’T speak out of passion. We’ve all heard that we shouldn’t respond to messages if we’re feeling angry, and the same applies for personal branding. If you’re feeling particularly passionate, before making a mistake that could permanently transform your persona, take a minute to develop your POV, stance and messaging. DO be prepared to address negative and positive feedback. Especially when you go to market with something surprising to your audience, expect both positive and negative reactions - be prepared with messaging that addresses all opinions. DO share your personal experiences. People trust people more than brands - so, be a real person.